This Facing History and Ourselves publication uses history to tart a conversation about pluralism and democracy today. George Washington’s 1790 Letter to the Hebrew Congregation in Newport, Rhode Island, a foundational document in the history of religious freedom in the United States, embodies a vision of religious harmony that remains deeply pertinent in our increasingly diverse society. In Washington’s Rebuke to Bigotry, scholars from across the disciplines use the letter as a springboard to engage with important and timely questions regarding religious freedom, religious diversity, and civic identity. 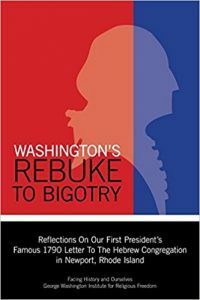 Washington’s Rebuke to Bigotry introduces readers to the complexities of the historical moment in which Washington wrote the letter when America’s founding leaders were negotiating how the new democracy would approach religious difference. Many essays in this collection also bring the spirit of Washington’s letter into the present, reflecting on contemporary issues such as gay rights in the United States, restrictions on religious practice in the public sphere in European countries, and the place of religion in education.